A patent fencing system that has no rails and nails. A simple and fast construction that combines the benefits of steel with timber. There is no central rail which provides better security. It is a stylish neighbour friendly looking fence as the good side is both sides. A neighbour friendly fence where both sides of the fence looks exactly the same. A simple construction with no nails plus has the benefits of both steel and timber. This fence system has an additional mid rail for extra strength. We are taking orders now, available within 18months. Both the two fence systems start at ground level with either timber sleepers or steel plinths keeping unwanted weeds, debris off your property. For the top your Paling Green™ fence systems, you can add an additional stylish decorative feature with the option to choose from a decorative timber or steel lattice. 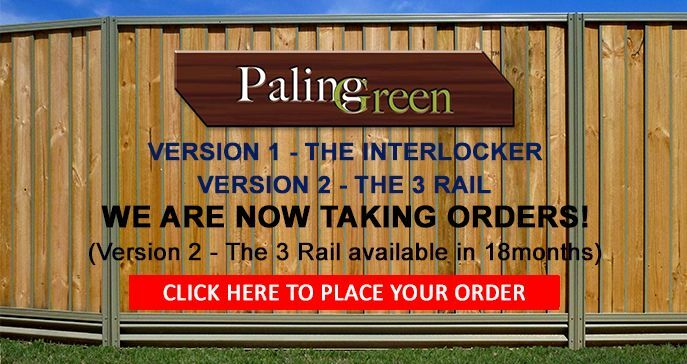 Paling Green™ Kit Gates is also available for both the Interlocking and the 3 Rail fence systems to match the complete fence. CLICK HERE TO PLACE YOUR ORDERS NOW!